Happy Easter from Yoga Pants Mafia (and Nugget)! Little Bunny Foo Foo needs a cocktail. Sometimes, you just have to riot. This entry was posted in Humor, Uncategorized and tagged 2014, awkward photos, Easter, Easter bunny, funny Easter picture, Nugget by Sarah. Bookmark the permalink. Made my day! At least you got her to sit?? Priceless. And, in your daughter’s defense, the rabbit is pretty creepy. I also love that you’re smiling. Great picture! I have SO many pictures like that of my kids. Including ones from vacations. Always a meltdown. Sesame Place was a DISASTER with all the characters. PS. Love the name of your blog. SO fun! Love that picture. Perfectly sums up my Easter! This is adorable. 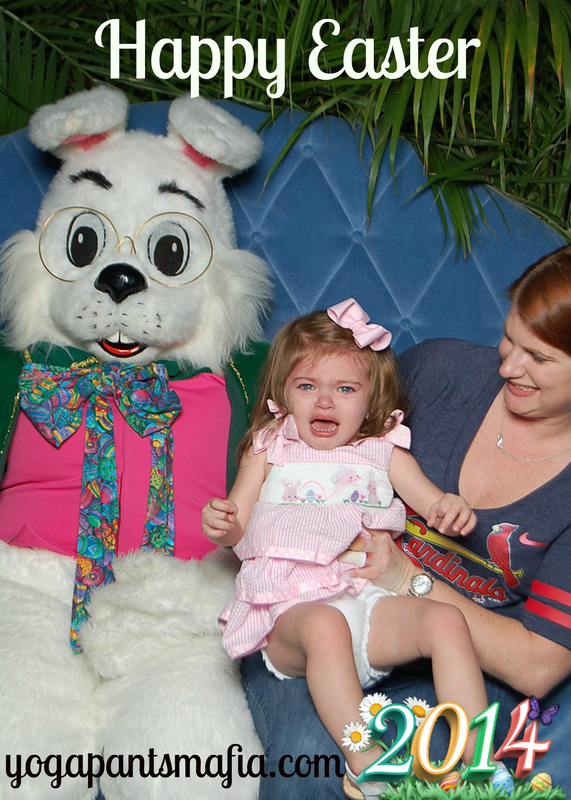 It’s almost a rite of passage to cry in a photo with the Easter bunny! I love it!